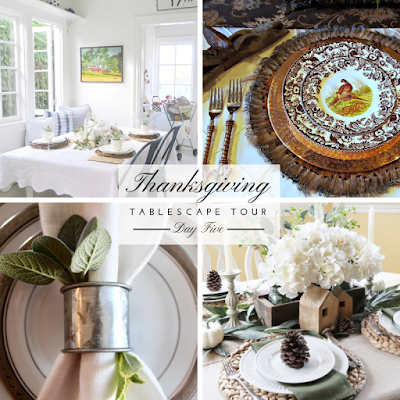 I am honored to be participating in the Thanksgiving Tablescapes Blog Tour, Day Five, hosted by Kristie of French Creek Farmhouse. 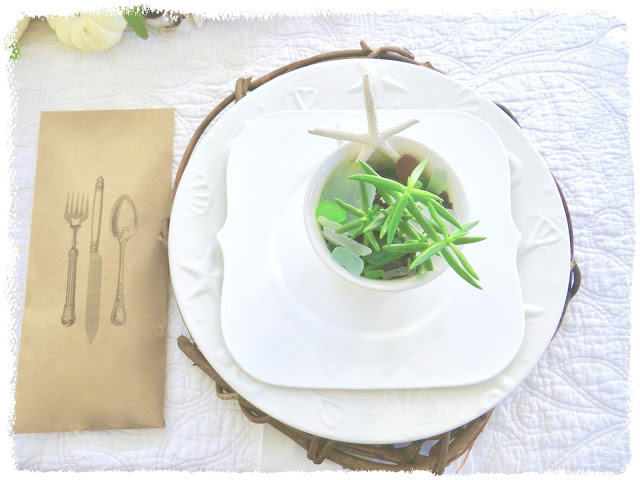 Kristie gathered an awesome group of bloggers to share inspiring Thanksgiving tables all week with a different group of bloggers each day - visit French Creek Farmhouse for links to today's posts as well as posts for all 5 days. and if there is one thing we have a lot of, it is shells. I had a couple of large white pumpkins so the only things I bought were a few Baby Boos and fresh eucalyptus to add to the shells. I prefer fresh flowers, but this centerpiece had lots of little gaps which I filled with faux white flowers and a few tufts of cotton. Beachy plates called for something other than a pumpkin so I filled cups with succulents, sea glass and a star fish to keep with the coastal theme. I finished off the place settings with grapevine wreaths as chargers, a fun salad plate and flatware envelopes I have had for years. The napkins are a gift from my sweet friend Donna of @lilyfieldsvintage - several years ago I posted on Instagram that I wasn't going to finish embroidering napkins for my Thanksgiving table and despite never having met, she told me to come down to the shop to pick what I wanted. 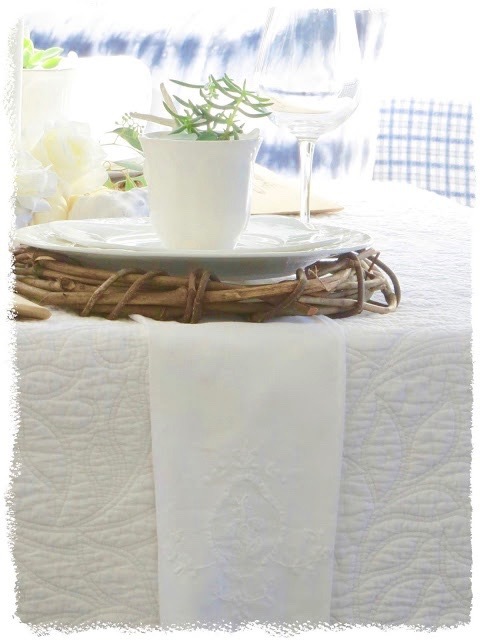 I love the texture of the quilt I use as a tablecloth combined with the hand embroidered napkins. and everything works well in our blue and white dining room. as does this view from the living room. Don't forget to head over to French Creek Farmhouse for links to all the posts. Carol, your Thanksgiving table is beautiful. You have a way of marring each design that you do with the seashore and therefore; it is easy to see your love of the sea. Gorgeous! 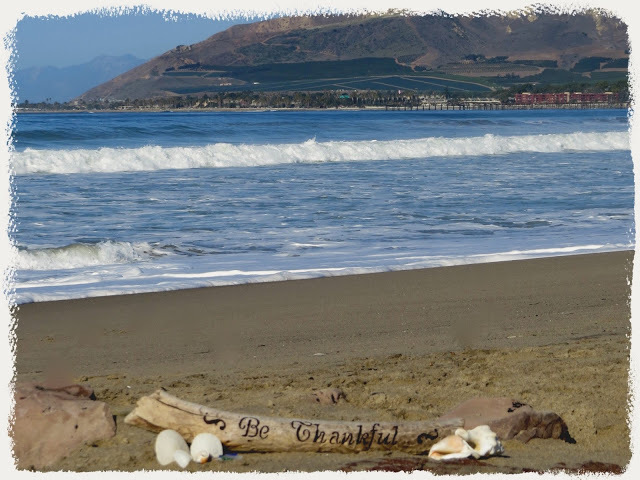 Have a sweet day and may the sea breezes refresh you and bring you tranquility . . . for that is the feeling that I got from your lovely Thanksgiving post . This is so beautiful! I love the white pumpkins and of course, anything coastal! Very pretty and calming, Carol. Absolutely stunning, Carol! Your tablescape and that centerpiece are gorgeous. I am a fan of shop your home too. Your table is so beautiful and I love the soft colors. You have done a great job with your tablescape. This is all so beautiful! I love the view with the windows open. 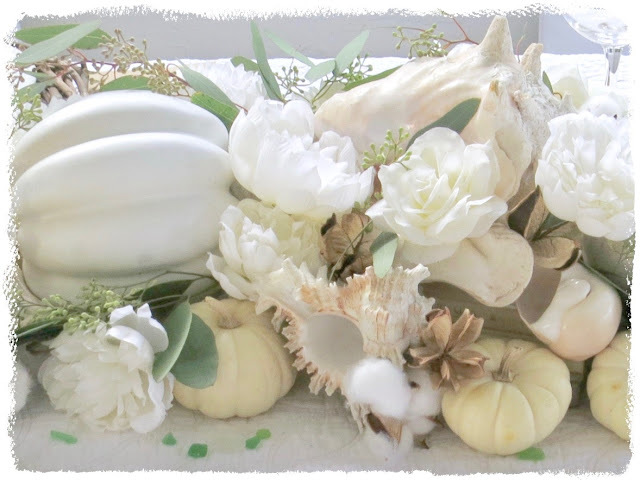 I love the way you mixed that coastal vibe with your Thanksgiving tablescape! And that quilt you used as a tablecloth is so pretty! So pretty Carol with all your neutrals. Soft and cozy. 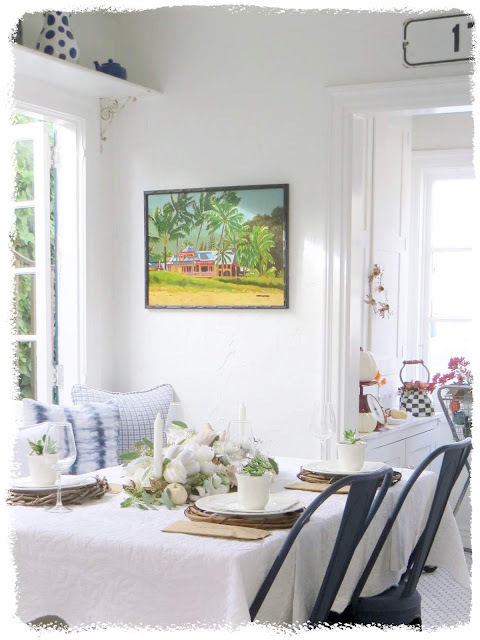 Perfect Thanksgiving table for your sea cottage. Such harmony in your little cottage by the sea. You take on nature's cues and hues so perfectly, and to me, this is how I enjoy the holidays, by letting nature do my decorating. WELL DONE!!! That all looks so beautiful. 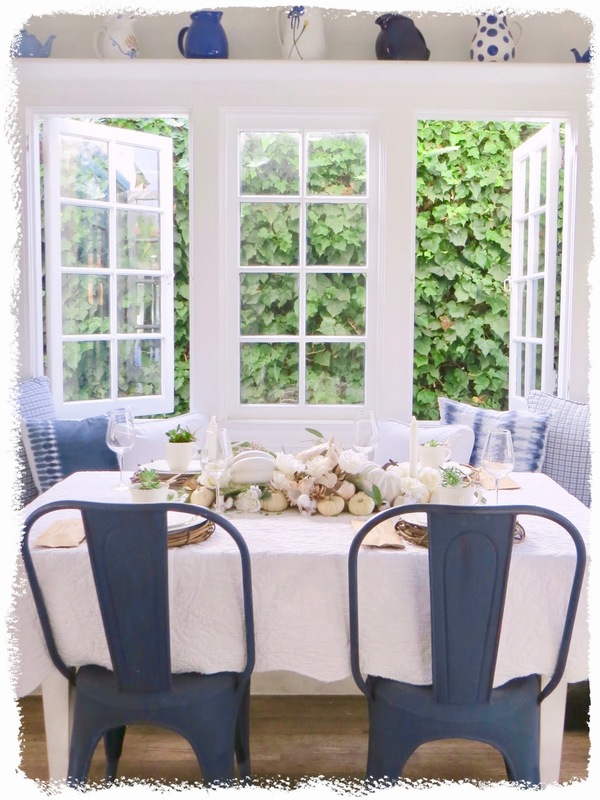 Love the dark blue chairs against all the white! I'm a shop-the-house decorator too. I don't need to add one more thing (but of course I will!). It's lovely. Cool and elegant. 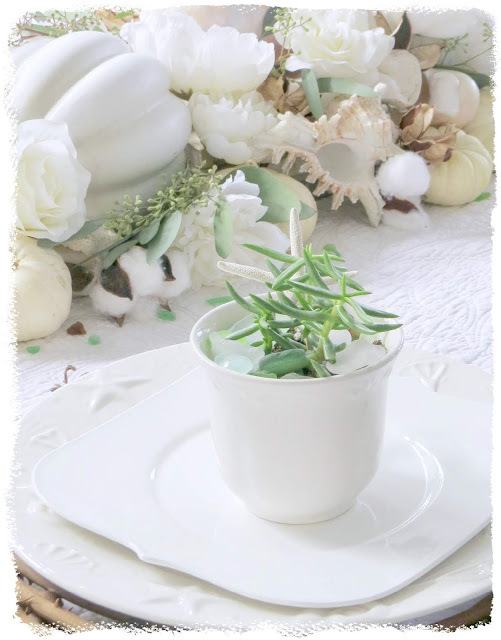 Carol such a pretty table for your seaside table. I remember you telling us about going to get the linens. It's made more special with the shells found near your pretty cottage. Such a calming view. So pretty! I do love your coastal look! I'm doing traditional colors for Thanksgiving this year. Your table is so pretty Carol. Coastal is such a lovely look. 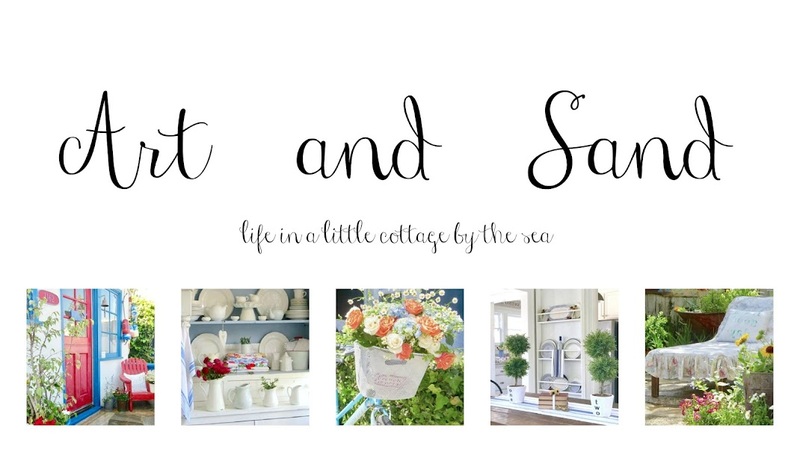 A cottage by the sea is a treasure. So sorry about the smoke and fire. The centerpiece is so pretty with the baby boos. Sometimes I called my toy Schnauzer, baby boo...LOL What a special gift your friend gave you. 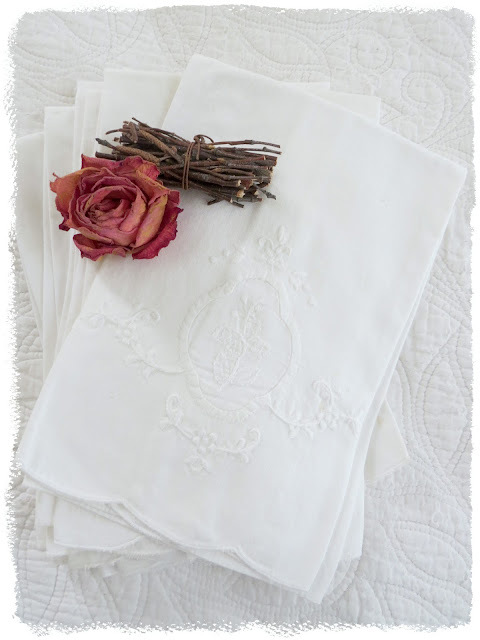 The linens are so dainty. Do have a wonderful weekend. Wow, I love it! I would have never thought to mix shells with floral- so creative and works perfectly in your amazing home! That quilted tablecloth is my absolute favorite! Such a pretty detail! Carol, every part of this is stunning! I just love it! It’s been such s pleasure to hop with you and get to know your gorgeous account! Happy Thanksgiving!!! Gorgeous, Carol! I love it! 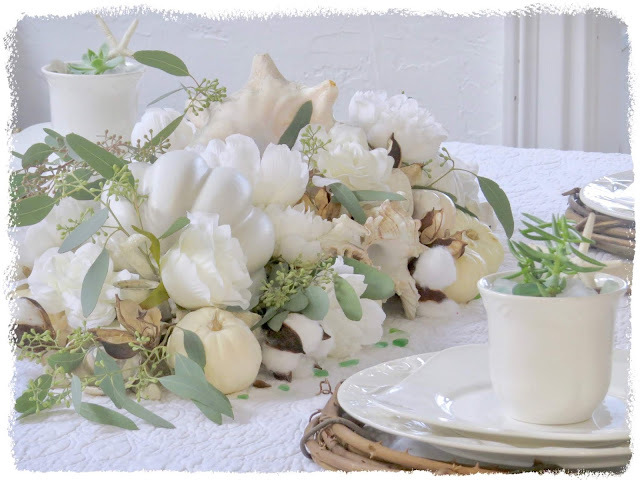 What is the base for your centerpiece? Beautiful Carol! 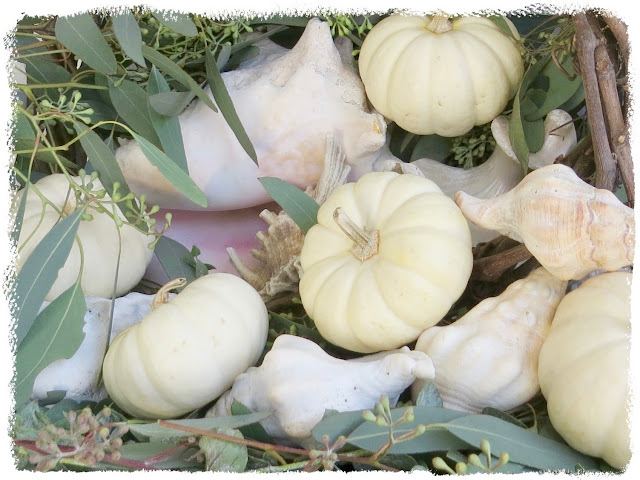 As an island girl myself, I have to say, there's nothing better than shells and pumpkins combined! Well, that and an endless summer. If only... ;) Happy Thanksgiving! So pretty! Love, love, love all the blue! 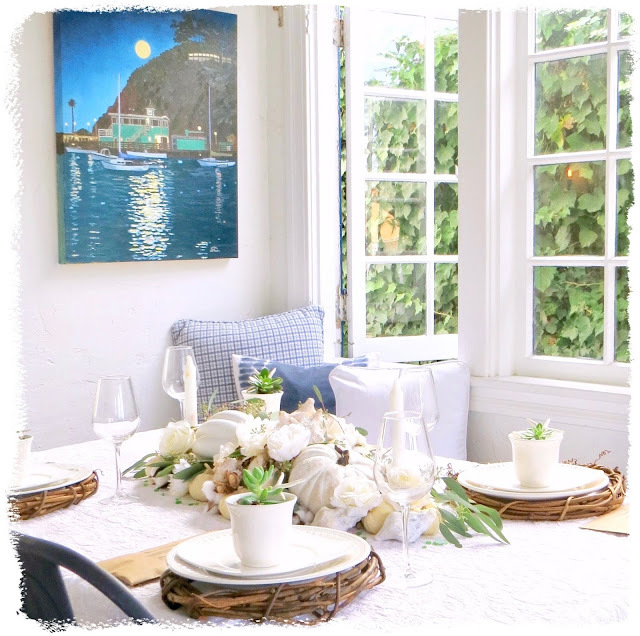 The tablescape is perfect Carol! 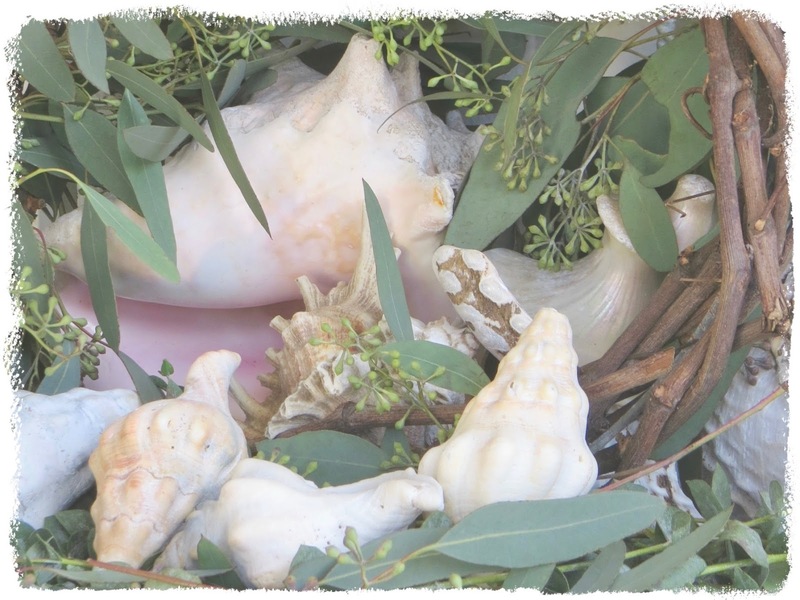 I love the mixture of the sea shells!! 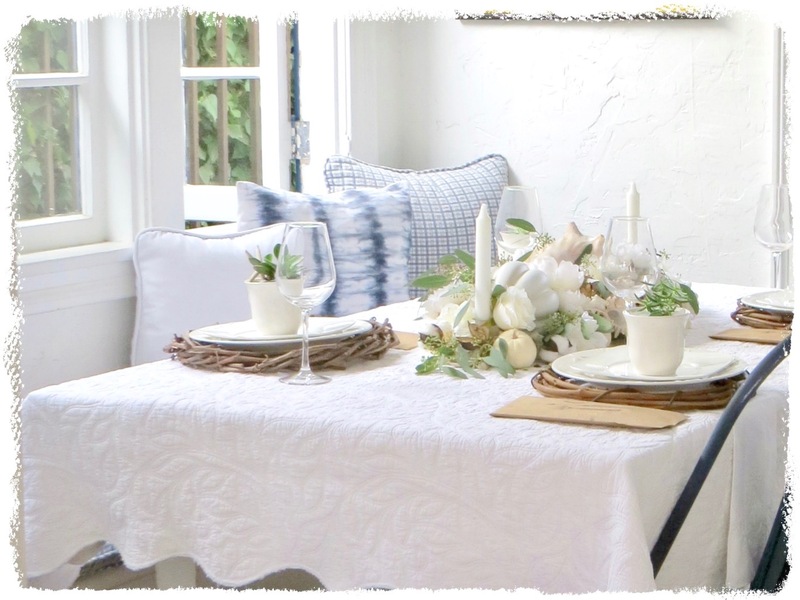 I love how you created such a calm and peaceful atmosphere with your Thanksgiving decor. I love everything about your tablescape!! 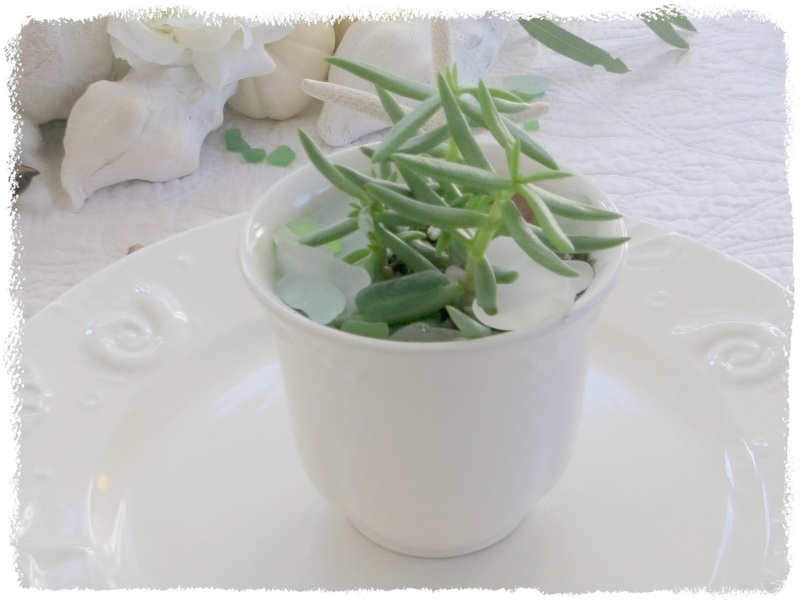 I love those sweet little succulent cups! And, I so love the center piece! 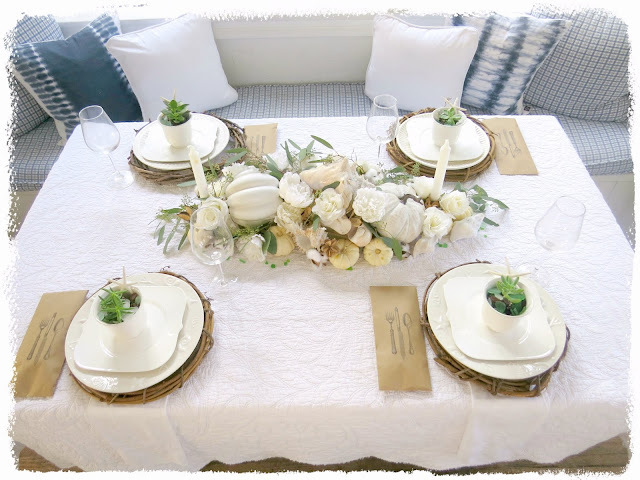 Seeded eucalyptus is always a must for my thanksgiving tablescape!! Love it! !